On my list for the summer is a series of hooked mats which capture the views from our small island. This is the first, looking south west to the far shore with one lonely tree on a rocky outcropping. I used lots of textured yarn and really loved the feel and the sense of freedom that comes with it. I am already planning the next one, in a rectangular shape. I think I’ll do a watercolour sketch first so that I get a better sense of the big shapes. 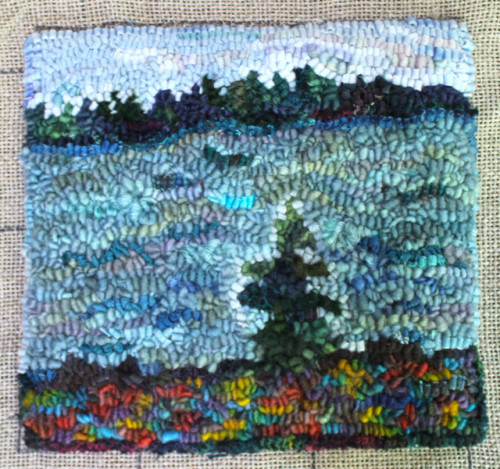 Sketching and rug hooking–perfect activities for a summer on the island. 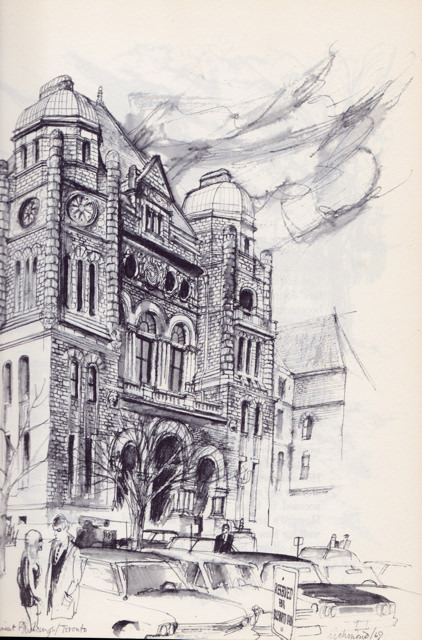 I recently found this great book of drawings of Toronto buildings published in 1969. 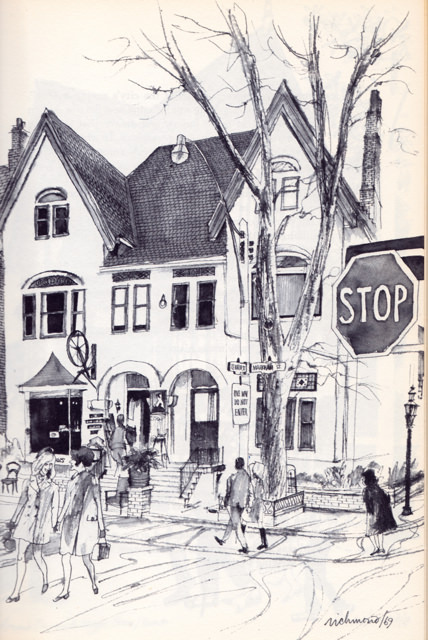 I lived in Hamilton then, but made many trips to Toronto which was far more exciting. 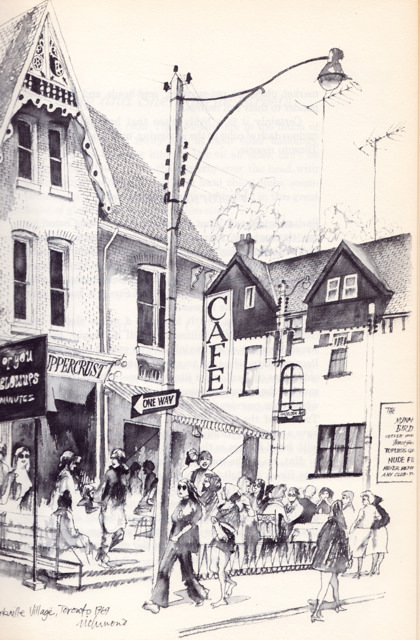 It’s been an inspiration to study John Richmond’s black and white sketches of the city. 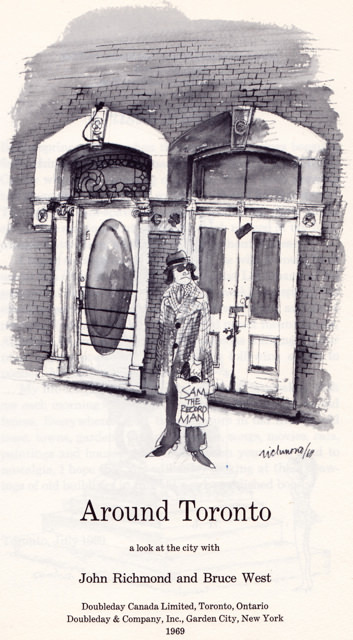 So much of the texture of the time is included–the fashion (bellbottoms! ), the street details, even the facial expressions. 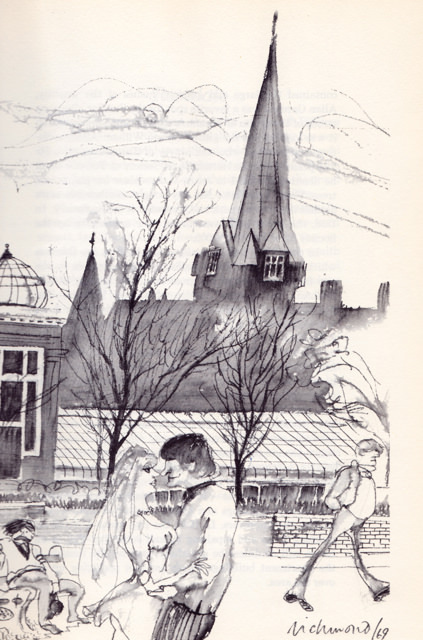 I’ve scanned a few here but could not include the many wonderful double page drawings. 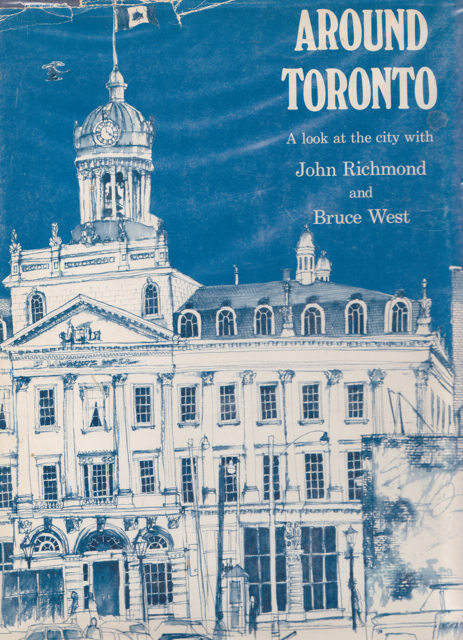 I hope those of you who know Toronto or would like to know it will love them. Don’t miss the wedding couple in the second to last sketch. And the last one which could be a bittersweet good-bye to the Toronto we knew then. I’m going to treasure this first edition which is even signed by the artist. 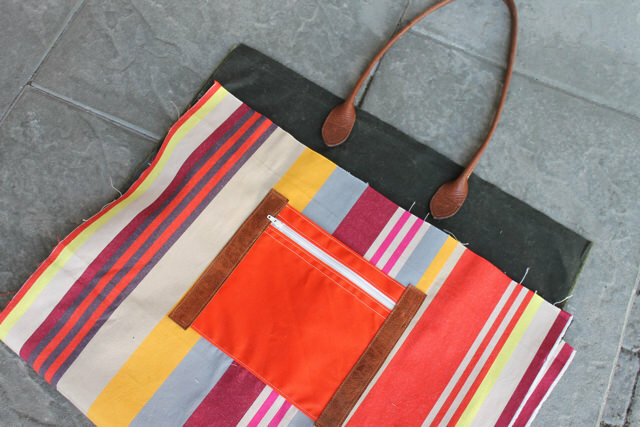 I am working on a new lightweight large travelling tote. You can see below the start of it below, dark moss waxed canvas with lovely smooth caramel leather base and a brass heavy-duty zipper closure. 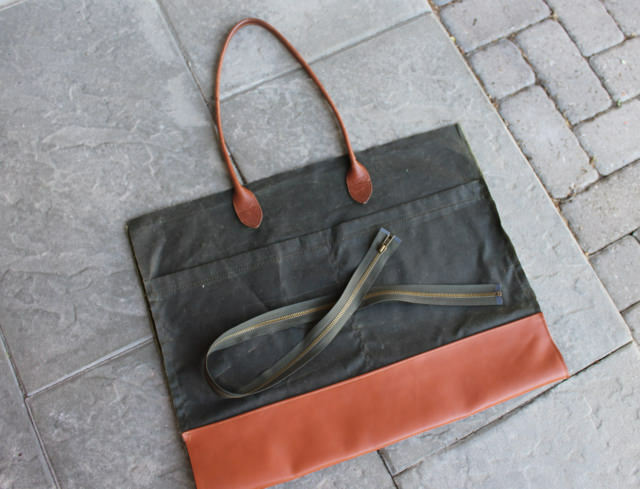 The carry handles are repurposed from another bag and there will also be a canvas and leather shoulder strap. I’ve said before that a travel tote needs more than one carry option when it is full. This one has two big exterior pockets and then four more pockets inside, one of them a zipper pocket for security. 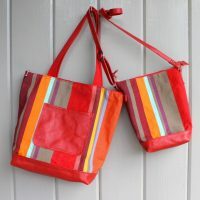 The lining is a wonderful canvas stripe I bought in Ireland and the pockets are bright orange waxed canvas. I like a bag with a great interior. This is the prototype and I plan to make some others using Marimekko coated cotton–in new patterns. Coming soon! 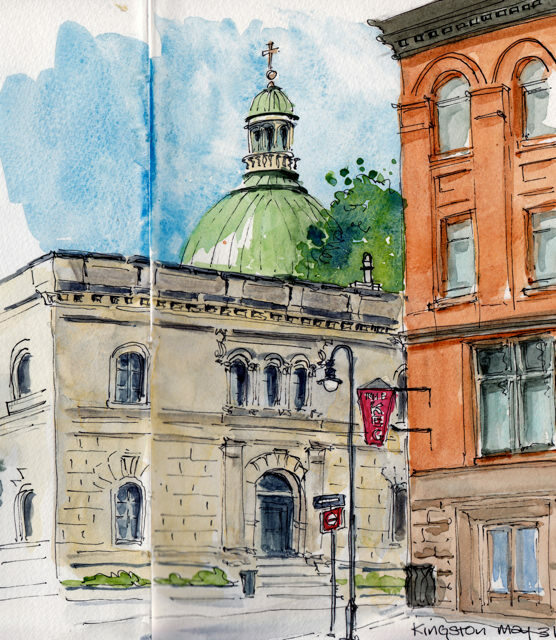 We were in Kingston yesterday and there was a little time to sketch. 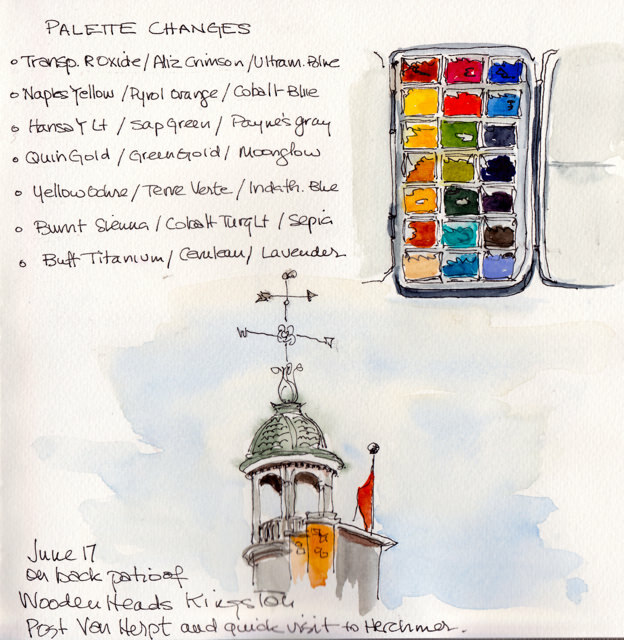 I have been changing my palette this week, removing colours–Potter’s Pink, Ivory Nlack, Bithume–and adding some different ones–Winsor &Newton Indanthrene Blue and Sennelier Sepia as well as the returning Naples Yellow. This link will take you to a great summary of blue pigments. I’ll work with these choices now, but it’s actually Indanthrone Blue which I’ll be looking to add. Thanks to Jane Blundell for the amazing resource which I will be studying more. We had lunch on a patio and I could just see this weathervane peeking over the wall so I had fun scribbling and adding paint while waiting for our pizza. It was a beautiful day in Kingston and after lunch I found a shady spot at the side of the church and set up my stool. I had a time limit, but really wanted to capture the glorious late spring day. Lots I can see the improve here–but with the help of Shari Blaukopf’s excellent landscape tutorials which I am re-watching, I’m getting ready for summer sketching at the cottage. Things have been very busy around here as our almost-three-year-old grandson has been staying with us for a few days. But after lights-out I found a little energy and time to hook the crows on Perfectly. If you read this blog regularly (thank you!) 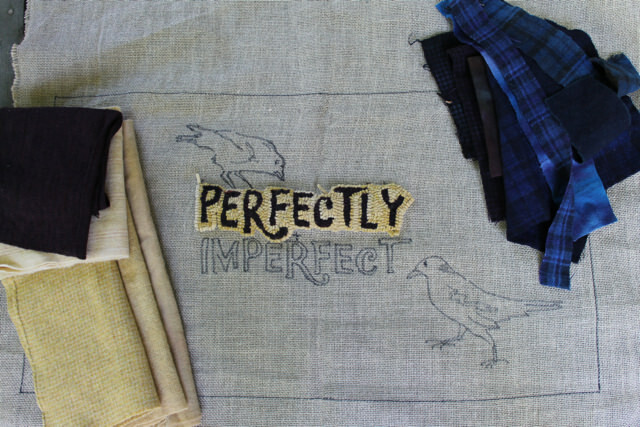 you know that this mat is for the Borders Class with Wendie Scott Davis in July. My last rug had the text as part of the border and for this mat the text is in the centre. So what will the borders be? I want to have an open mind going into the class and see what happens…but if you have any ideas, I’d love to hear them. I’m almost half-way through the whipping of Annie. I’ve promised myself I will not post any photos until the job is complete, in another month, I hope. But anyway, it’s time to start a new project. 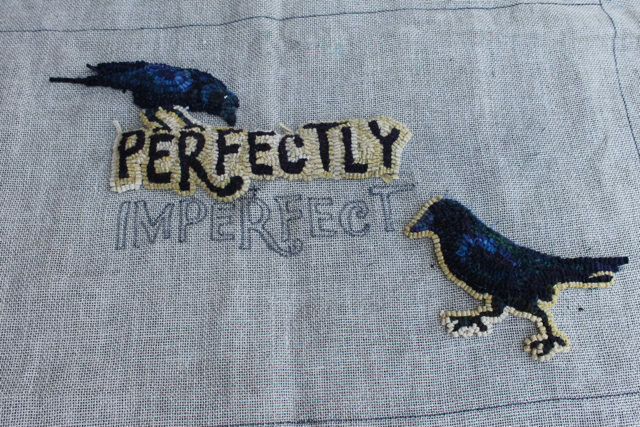 I’m part of a show at a local gallery next fall, so I thought it would be fun to hook my slogan, Perfectly Imperfect, with a couple of crows looking on. I’m taking a course in borders at our local college in July and we were to hook the centre of a rug and come prepared to design borders. So this little runner fits the bill for that too. I’ve piled some colours that I think will work for the birds. I love to use over-dyed Pendleton shirts to get a variety of values and shades. I’m soon going to start on the crows whom I already know are smarter than I am! 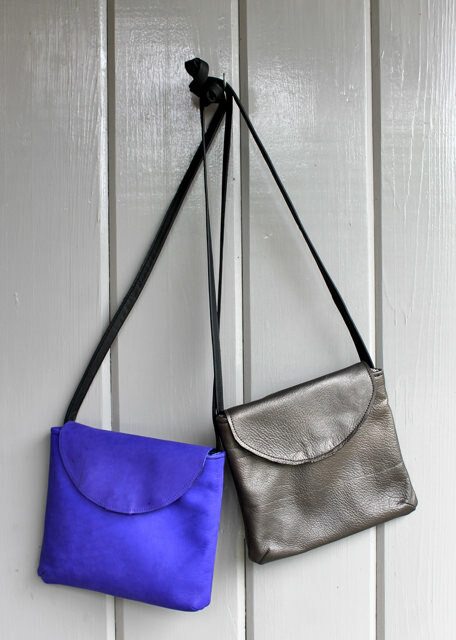 Here are two samples of the new 121 bag, cobalt blue and pewter. 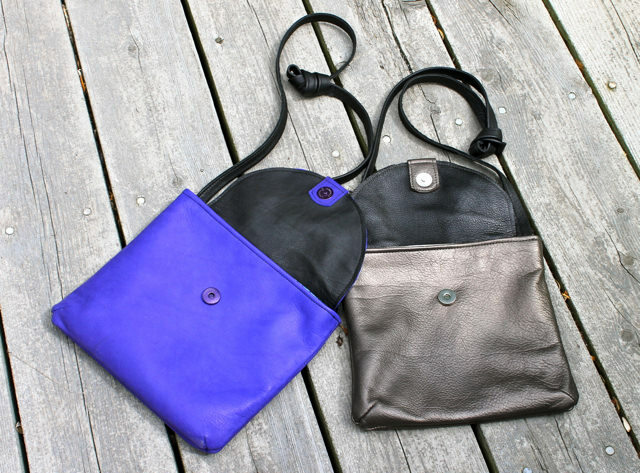 These are each made with remnants of simply beautiful pieces of leather. The bags are approximately 9″ tall and 8″ wide with darted bottoms for extra room and a 46″ cross-body strap which can be shortened with a knot. The rounded flap is backed in black leather and closes with a magnetic snap. 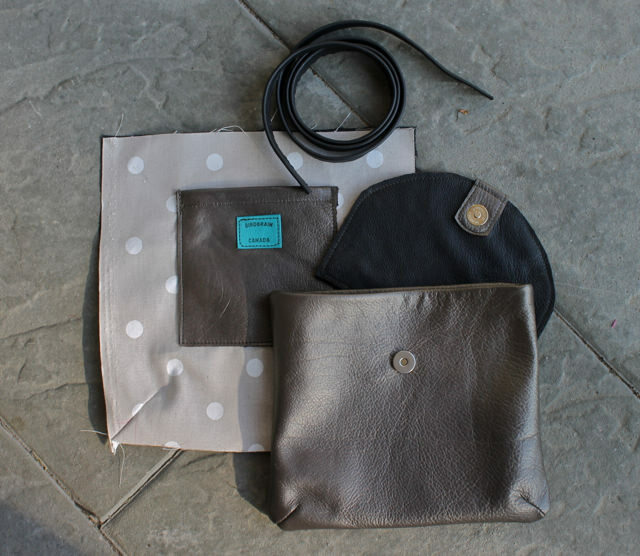 The bags are lined in 100% cotton, the blue from Kenya and the tan polka dot from Ireland–both glimpsed in the last photo–with a leather phone pocket. This bag will hold all your essentials for a evening out or as an extra with a larger tote. They will be in the on-line store tonight. I am working on a new small shoulder bag. One that is great for a night out or a trip to the shops. 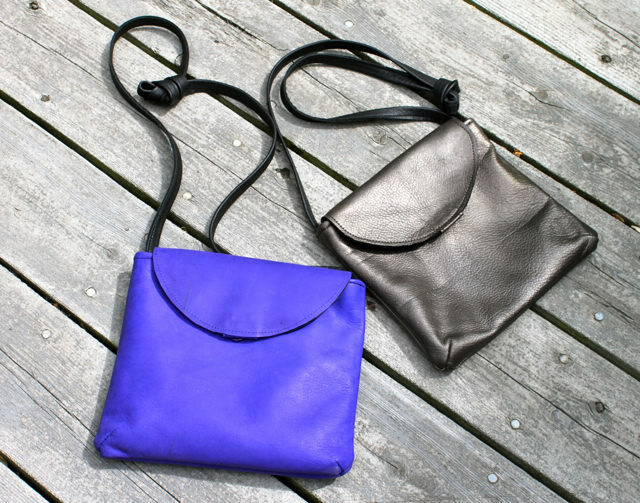 A light and easy small bag with clean lines and a simple cross-body strap. It will have a pocket for your phone and ample room for other essentials like keys, cards and sunglasses. 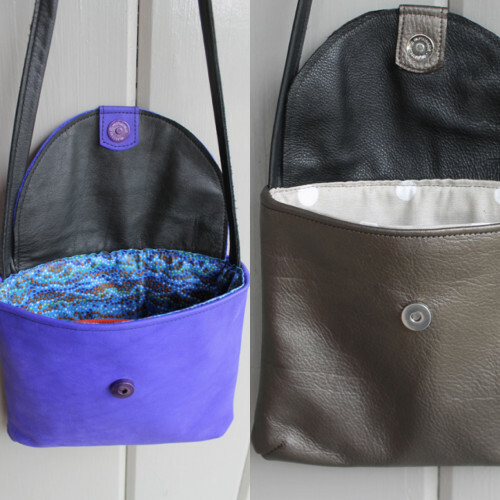 I have several remnant pieces in great colours, so these will be one-of-a-kind bags. Here are the component parts for the first prototype in pewter with polka dot interior. Working on one today in cobalt…will post when both are finished. 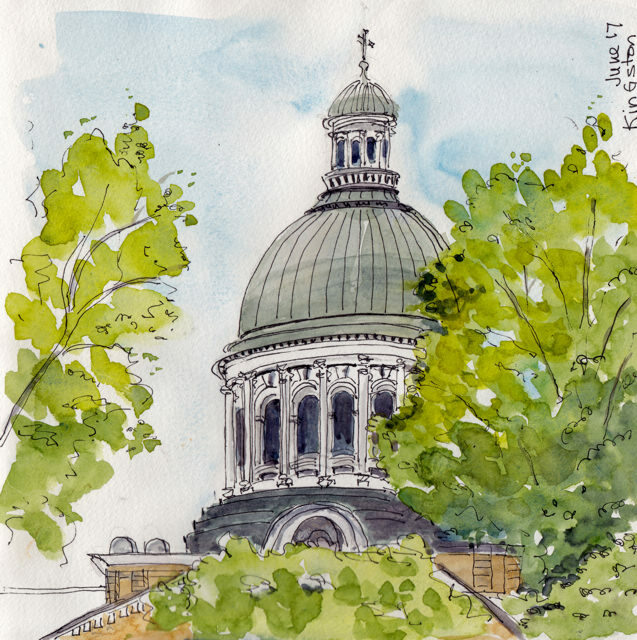 We were in Kingston yesterday and I had time to sketch while my husband worked on our son’s sailboat. I set my stool up beside the market vendors behind City Hall. I got the sketch done and the first layer of paint on before it was time to meet the rest of my family at the Tett Centre on the shores of Lake Ontario. The Tett is a beautifully renovated limestone building originally part of the Morton Brewery and Distillery Company. It now houses many of Kingston crafts and artistic groups. In addition it has a super café with tables right beside the lake. As for the sketch…I’m still working on natural-looking windows and perspective as you can see.